We met with Tino and Magda (from Portugal) at the ferry dock at 8:00 in the morning. We parked and went in to buy tickets. I gave the lady both our passports and told her we had a motorcycle and trailer; she gave me two tickets, one for the bike and one for Kathy. I didn't worry because on the ferries at home the ticket for the vehicle includes the driver. They just assume the vehicle is not there by itself. Tino looked at my tickets and we went back to get one for me. Here every passenger pays, even the driver. 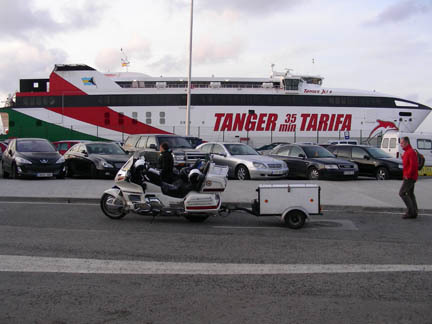 Then as we went to get on the ferry the man wouldn't let me on without paying for the trailer, although the agent inside said I didn't need a ticket for the trailer because it was so small. So we bought another ticket for the trailer and finally boarded the ferry. It left 30 minutes late but Morocco is 2 hours (one time zone and no Daylight Savings Time) behind Spain so we arrived in plenty of time. Before arrival in Maroc (that is how they spell it), on the ferry, we went to passport control, filled out papers, and all the information was added to a computer. On arrival we then went to another office where they again added it to a computer. We then went to another window where they added it to a computer along with the bike information. We had to buy vehicle insurance, so we walked out the gate and bought it at another window, where they again put the information into a computer and took my money. Finally we were under way and headed through Tangier with Tino leading, they have been here several times before. We drove straight thru and headed south on the toll divided highway. 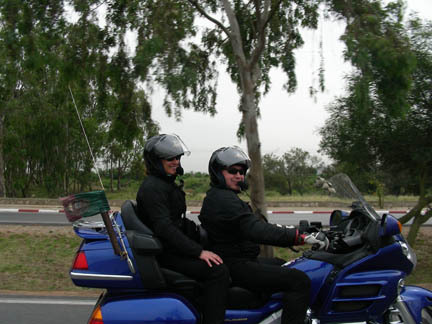 Rabat is our destination for now and where we part company with Tino and Magda. They are headed inland to deliver some things to friends there. We are headed to the city of Rabat. Morocco was the very first country to recognize the brand new United States of America as a country in its own right. This was in 1776. I'm writing this on our third day in the country and the Moroccans are just a friendly to the US now as they were then. We have never been welcomed by strangers on the street as much as we have been here. We were even waved over to a stop at a police checkpoint because the officer wanted to look at the bike and welcome us to his country!